A 10 nights / 11 days journey combining Kenya’s most exciting wildlife-rich wildernesses and undiscovered beach. Experience the elegant, luxurious Saruni Samburu, Saruni Mara and Saruni Ocean. Delight in unending views of pristine wilderness, from the teeming plains of the Masai Mara, to the rugged Samburu landscape and uninterrupted ocean views from Saruni Ocean. 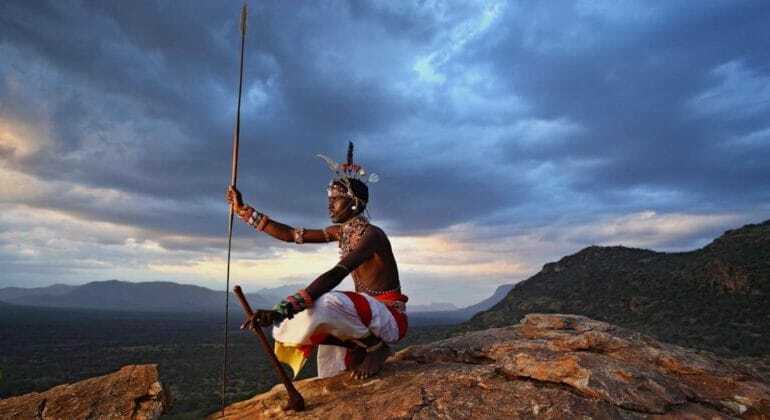 Discover two of Africa’s most authentic and fascinating tribes – the Maasai and Samburu – learn first-hand about their ancient customs and local knowledge. Encounter Africa’s classic and diverse wildlife up close in their natural habitat, from the most wildlife-abundant ecosystem in the world – the Masai Mara, to the rare species only found in Samburu. Soak up the equatorial sunshine and relax, rejuvenate and unwind on the undiscovered, white-sand Saruni Ocean beachfront on Kenya’s stunning South Coast. Depart Samburu on your flight in the morning* and arrive in the Masai Mara an hour and a half later. • Game drive with a picnic lunch to enjoy under an acacia tree or by the river next to a pod of hippos, or head to Saruni Mara for some rest and an exclusive game drive later in the afternoon in Mara North Conservancy – over 30,000 acres of plentiful, protected land bordering the Masai Mara National Reserve. Enjoy a completely different and less-explored corner of the Mara ecosystem in total privacy, brimming with wildlife. Early morning game drive to look for the big cats and other predators of the Mara, returning to the lodge for lunch and treatments at the Maasai Wellbeing Space. • In the afternoon, a game drive will take you to a special area where the largest ‘tower’ of giraffe can be seen, followed by dinner at the lodge and an optional night game drive. Walk in the forest that surrounds Saruni Mara or a game drive up to the top of Kilileoni, the highest mountain in the Serengeti-Masai Mara ecosystem – led by your skillful and knowledgeable Maasai guides. • In the afternoon you will discover more of Mara North and its surrounding conservancies and experience first-hand what makes the Mara one of the most exciting wildernesses in the world. • Weather permitting, experience a bush dinner in the middle of nature under the vast African sky, with Maasai warriors singing and dancing around the fire. Wake up for an early morning dip in the sparkling 1000 sqm infinity pool, a walk on the beach followed by a relaxing morning of pampering treatments at the Sarunity Wellbeing Space. • Spend the afternoon snorkelling the beautiful coral reefs and exploring the nearby coastline. Start the day off with a sun-saluting yoga class, followed by a morning massage and a dip in the warm Indian Ocean. • Explore the local fishing village and get to know the people and the culture of this small, undiscovered paradise. • Embark on a deep sea fishing venture for the afternoon, and try your hand at deep sea fishing. • Enjoy a romantic, intimate dinner on your private veranda or in a secluded nook of the beach. Included Full board accommodation, conservation fees, all internal flights and transfers (including taxes), airport meet and greet, temporary Flying Doctors membership, game drives in 4×4 vehicles, soft drinks, beer and house wine and local spirits, laundry, one complimentary half hour massage per room at all three Saruni properties. Saruni Samburu’s six luxury villas are open and spacious, heralding spectacular views over Kenya’s Northern Frontier District and Mount Kenya in the distance. The warm and welcoming hospitality makes for an intimate and exceptional experience. The lodge is revered for its innovative, eco-chic architecture and interesting design and décor, as well as its Italian-inspired cuisine. Guests can enjoy the vast panoramas from the dining and lounge area, the infinity pool and the Samburu Wellbeing Space. Saruni Samburu is the only lodge in Kalama Conservancy, which borders Samburu National Reserve, with 200,000 acres of unspoiled wilderness to explore and enjoy exclusively. You are guided from start to finish by Samburu warriors who are passionate about their land and their culture, learning first-hand about their fascinating customs and traditions and gaining ancient, local knowledge about the land and the animals – a truly authentic experience. Activities and amenities: day and night game drives, bush meals, guided walks, birdwatching, Samburu Wellbeing Space treatments, picnics, two swimming pools, helicopter excursions, Samburu cultural visits, Saruni Shop. Saruni Mara & Saruni Wild Saruni Mara has one family villa, one private villa and five elegant cottages, and is the only small boutique lodge in the Mara, making it very intimate and exclusive. The beautifully decorated themed rooms have a luxurious and classic safari feel. The lodge is tucked away in a secluded valley in the private Mara North Conservancy, a prime and private game viewing area, which borders the Masai Mara National Reserve – the most renowned wildlife park in Africa. Enjoy the Italianinspired cuisine and being immersed in nature from your private veranda, the Maasai Wellbeing Space and the open lounge and dining area. Maasai warriors will guide you throughout your stay, sharing their ancient wisdom and local knowledge of the area and the animals, their way of life and their secret corners of the most loved wildlife reserve in Kenya. Activities and amenities: day and night game drives, bush meals, guided walks, birdwatching, Maasai Wellbeing Space treatments, picnics, library, balloon safaris, Saruni Shop. entered around an authentic health and wellness experience, guests can relax, rejuvenate and unwind in the sparkling 1,000sqm infinity pool or at the unique Sarunity Wellbeing Space with pampering massages, replenishing beauty treatments and daily yoga and other exercise classes beachside. Attention to detail, beautiful style, fresh cuisine, and secluded location – Saruni Ocean is a truly exceptional ‘beyond luxury’ experience. Activities and amenities: Sarunity Wellbeing Space, large infinity pool, yoga/exercise classes, game drives to Shimba Hills National Reserve, diving in Kisite Marine Park, golfing, deep sea fishing, sightseeing cruising, visit to Funzi mangroves, kitesurfing, stand up paddling and skydiving. This is a fly-in safari beginning and ending in Nairobi, Kenya.